HASLETT, MI - Friday November 30th the Haslett Vikings took on the Ionia bulldogs for their 2nd game and home season opener. Offense for both teams started out slow and sluggish for parts of the 1st half. 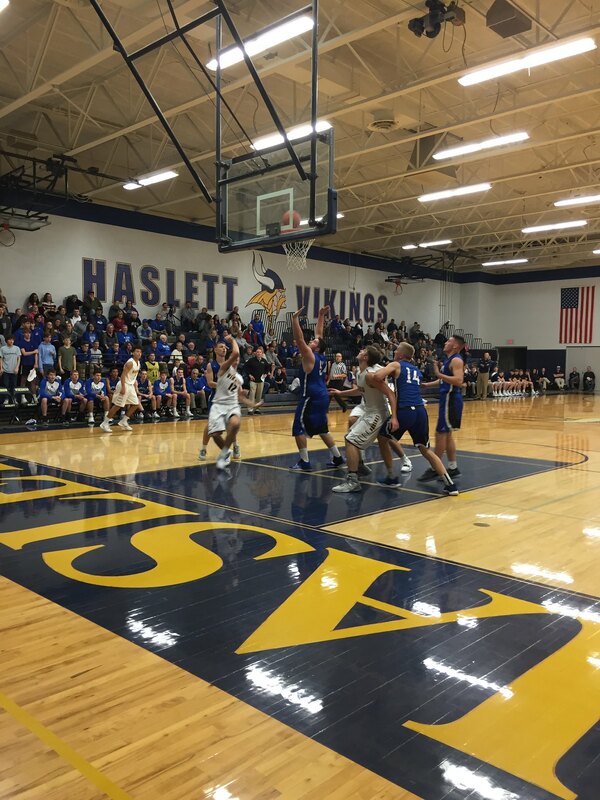 But once they picked up, Haslett Vikings used their high tempo offense and aggressive defense to run the score up. The Ionia Bulldogs did not fall far behind at all. They run a mostly man to man defense and have strong scorers such as #20 Senior Guard Brady Swinehart. He was one of their leading scorers. For Haslett leading scorers included #5 Mitchell Mowid, Senior Guard, who has nice and simple inside the paint skills but can play the perimeter as well. He and #2 Ty Andrades, another Senior Guard led the offense in high scores by pulling fouls and moving the ball around to create space for open shots. At Halftime the score was Haslett 28 and Ionia 26 after a major buzzer beater went in by Haslett, swinging the momentum their way. By the end of the 3rd quarter the Vikings had pulled away from the Bulldogs. At the start of the 4th quarter the Vikings had a 19 point lead with a score of 56 to 37. The Ionia Bulldogs did a great job of playing hard defense, moving the ball around, and pushing the ball up court. They had high energy all night and they play a zone defense. The final score of the game was Haslett 69, Ionia 60. Both teams had a total of 10 Team fouls for the entirety of the game. With this loss Ionia’s record comes to 1-2 overall. With Haslett pulling out the win they bring their record to 2-0 staying undefeated as their next 4 games are on the road. They’ll be taking on the 2-0 Mason Bulldogs in Mason on December 7th, tipoff at 6PM. UPDATE: The Vikings lost to Dewitt, a final score of 41-38, and Won against Mason. Final score was 70-52. The Haslett Vikings have an overall record of 3-1.